Should You Make a Fashion Blogger the Face of Your Non-Fashion Campaign? You’ve probably seen them, people who have hundreds of thousands of online followers because they have mastered the art of looking good and dressing well. No small feat. These fashion bloggers possess measurable influence within their online communities. From a marketing standpoint, it makes sense that brands want to do business with them. If you’re a brand that sells clothing accessories, and beauty products collaborating with the right social media influencers is probably on your list of things to do. Just make sure that the influencer you target has influence over YOUR target audience. I'm going to be very specific here. In this article, we’ll explore some of the strategies you can use to target fashion bloggers if you’re not a fashion brand. We’ll also look at some examples of this done right to give you some inspiration. BUT I want to insert the disclaimer here that this post is not encouraging you to target any influencer who has a large following just to sell your thing. What I am saying is with the right creative strategies, you can grab the attention of an audience that may not - at first glance - seem like the most obvious choice. You might be wondering why you would want to target fashion influencers if your brand has nothing to do with fashion. That's the same question we answered in this post on how to get in on the Thanksgiving shopping frenzy with a product that had nothing to do with Thanksgiving. . These influencers can still provide you with a great deal of value as their content has such a wide reach. With tens or even hundreds of thousands of loyal followers, getting your brand name mentioned in one of their posts could expose your brand to thousands of new users. This could lead to new followers and increased interest in your brand and its products or services. The key, however, it to find a link between your brand and the kind of content that the influencer posts. If the influencer doesn’t see a logical link or just isn’t interested in your brand, then he or she is unlikely to agree to team up with you. For influencers, their reputation is everything. Their reputation is a valuable asset that they leverage to wield their influence. In short: They're not gonna let you come in and mess that up. Preserving their online business means protecting their reputation - even if that means protecting it from you. But your audience may include a segment of the influencer's audience. And therein lies your opening. Let’s say you run a travel experience company that likes to target Millennials who are interested in taking a few months or a year out to travel the world. Yes, there are fashion bloggers who travel. But there are also fashion bloggers that appeal largely to the type of Millennials who are adventurous, have time flexibility, and who are okay going it alone. A fashion blogger who targets Moms might like to share recipes or products related to children. Fashion bloggers who do well with middle-aged men could team up with a brand that sells recreational sports equipment or hand tools. It might take some imagination to ensure the posts don't look like the most obvious product placements in the world, but the point is that cross-section where the influencer's audience intersects with your target audience is your sweet spot. Now, let's get into some good, old-fashioned digital marketing strategies. Luckily, the fourth bullet point listed there is made easier by the fact that these influencers know what they’re doing and tend to have a lot of ideas of their own for content creation. You know your product. They know their audience. So, you must be willing to give your influencer a large degree of control over the content being created while having criteria in place to ensure the message stays true to your brand's values and deliverables. This leaves the first three bullet points as your main responsibilities. Do lots of research into fashion influencers to determine which would be suitable for you to work with. Once you’ve selected a handful, it’s time to start engaging with them. If you contact them out of the blue and propose a partnership when you don't know them and they don't know you, expect a no. Follow the influencer first. Comment on their posts, share content with them. Do whatever you can to build a relationship before you reach out. When you do eventually approach them, you will know what they are about and have a bettr idea of the best ways to approach them. with a proper proposal. Then you can tell them about your product, what you're thinking, and how you think this particular collaboration could prove mutually beneficial. It may sound counter-intuitive, but sometimes, the best way to stand out is to blend in. This is an easy strategy for working with fashion influencers. They’re taking pictures of their latest outfit on a regular basis, often every day. Unless they opt for a super close-up shot, there will likely be a way for you two to seamlessly integrate your product into the post and to make it better without seeming overdone. For example, an influencer could promote the brand that sells the furniture they’re sitting on, a piece of artwork on the wall, a TV or computer that’s on the table behind them. It’s easy to work these kinds of products naturally into a photo that they would be sharing anyway. The example above is from the Instagram of Rachel Pitzel, a fashion and travel influencer who regularly posts photos of herself spending time with her son and daughter. In the post above, you see an overhead shot of Rachel cuddling with the kids, but she's doing it on a comfy custom sofa from Joybird. And the entire sofa is in the shot. So, your product doesn't have to be up front and centered to have an effective sponsored post. Blending in can be a more effective placement. No, this tip isn’t just about having an influencer show some cleavage in an IG post (although that may have been their strategy in this example). This is all about making the most of the fact that fashion bloggers are all about looking good. And that isn’t just about the clothes, jewelry, and makeup they’re wearing, but also about how their health impacts their quality of life and their bodies affect their self-image. In this example, @thehautebrunette shared a sponsored post chronicling her at-home workout. She mentions fitness company p.volve and a specific piece of fitness equipment they sell - the p.ball. The post predominantly features Alyssa Melendez herself sporting active wear, so followers can still get a taste of what she wears in her day to day life. The p.ball is then positioned next to her with the p.volve logo facing the camera, so the brand is featured in the picture without being overly promotional or in your face. This is a great way for health, fitness, and wellness brands to work with fashion influencers since their followers are interested in how the influencer pulls off certain looks. A fitness brand could increase brand awareness by partnering with a fashion influencer who also extols the virtues of maintaining an active lifestyle. Everybody eats, even (or expecially, depending on the influencer) fashion influencers. So, food and drink brands can get in on the action by being an influencer’s snack, beverage, or grocery store of choice. This can be as simple as having your food or drink featured in the background of a post where a fashion influencer is showing off their latest outfit. For greater prominence, the fashion influencer could be holding or actually consuming the food or drink in the photo. Of course, fashion influencers are often more creative than this, like the above example of Sazi Hills, aka @fashion_53. In this sponsored post for Pepsi, she takes things a huge step further than the simple can of Pepsi Max in her hand. She’s taken the product and used it in an innovative way, and a way that’s relevant to fashion and style, no less. If you look closely, you can see she rolled her hair with empty Pepsi cans! The post is original, trendy, stylish, and sort of hilarious, really. And this post stays in line with the influencer's brand. Her followers loved it. The post garnered more than 5,000 likes and comments in appreciation of her unique style. Kids and puppies. They make post just a little better. And if you put them together... (eye roll) You can liven up an otherwise humdrum sponsored post by partnering with an influencer who has kids. What's cuter than a tot in a 3-piece suit, sitting down to do his taxes? Or plan for retirement? "No time to waste. I'll be 5 before I know it!" Well, if your brand isn't super glamorous, a good way to win the hearts of your target audience is to throw in a few handfuls of cuteness. And when it comes to cuteness, we all sort of soften for the innocence of a child or a cute pet. Fashion bloggers who are also parents often post about the clothes that their kids wear and the brands that provide them, as well as their own clothes. So, what other types of brands can use the ‘aww’ effect that kids provide when they’re collaborating with influencers? This strategy could cover a wide variety of brands because parents need a lot of supplies to look after their kids, so they can potentially promote lots of different things. So, let’s look at a couple of good examples. This post from @walkinginmemphisinhighheels, aka Laura Lee, came at an appropriate time – that miserable time when everyone is suffering from colds and flu. She is promoting the cold medicine she used to help her daughter recover from “the sniffles,” Matys Chest Rub. This cute picture of her and her daughter is a nice, wholesome sponsored post that warms your heart while also offering a solution for any parents who want to keep their kids from suffering through a cold. As an added bonus, this post is also a giveaway in partnership with Matys. Kelly and her daughter Kennedy are the dynamic duo featured in most of the posts shared on @_thevintageblonde_. She often mentions her daughter’s stylish outfits, and poses alongside her daughter in posts like this one, to promote brands she finds useful as a parent. In this post, Kennedy adorably poses eating Cuties Citrus easy-to-peel oranges, with a cheeky smile on her face that would make any parent want to go out and buy some for their own kids. A cute dog in a photo can help you sell just about anything. But, a fashion influencer with cute pets, especially ones that regularly make appearances in the influencer’s posts, presents a great opportunity for brands targeting pet owners. This could range from the less interesting necessities such as pet insurance, to more exciting things like clothing for pets. In the example above, fashion and beauty blogger, @krystintysire is promoting Icelandic dog treats with the help of her gorgeous assistant, Bella. This kind of post can attract attention from dog lovers because Bella is simply adorable. The dog treat brand is likely to get some more traffic, more views, and even new customers because the cross-section of Krystin’s followers who are also dog owners may be compelled to check out Icelandic dog treats on her recommendation. One easy way to get your product into a fashion influencer’s post is to offer it up as a prize. This gives you a lot of flexibility when it comes to partnering your unrelated brand with a fashion influencer. If you have products, gift cards, or other freebies that can be given away as prizes, then you can get involved with an influencer in that way, particularly if there is a holiday on the horizon (like July 4th, Father's Day, or Halloween) that would make a non-fashion gift card or store credit seem like a pay-it-forward opportunity. Most influencers will partner with a brand as long as they like and believe in their products or the brand itself. Influencers are unlikely to partner with you if they don’t support or agree with the way you work or what you stand for. In the above giveaway post, @ashleyspassionforfashion has partnered with another blogger and Nooga Boutique to offer a huge giveaway. Some of the prizes included are fashion related, including items of clothing and a Nooga Boutique gift card. However, there is also a $25 Starbucks gift card included in the prize. Starbucks is trendy, but it has very little do with fashion. The company still gets mentioned in Ashley’s posts by partnering with her to offer the gift card. If your company can offer a desirable prize, you can make the most of this strategy. Products such as iPhone’s and tablets are also very popular prizes in giveaways. As you would expect, these kinds of high-value freebies can attract a lot of attention and contest participation. Looking at this picture, you probably wouldn't notice right away that it's a sponsored post, which is good. If a post is blatantly an ad, it can really turn people off. Followers are more likely to scroll past without engaging if the post doesn’t fit naturally with the rest of the account’s content. The image in this post is of a group of well-dressed women, which fits in with the usual content of @fashionistamomma. 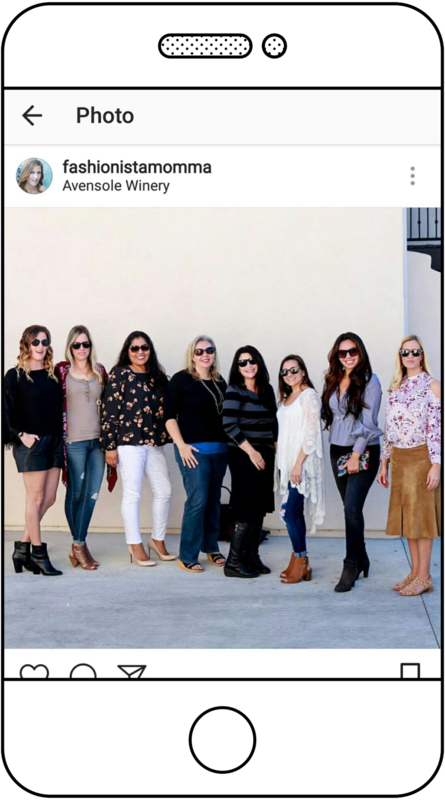 The caption then makes it clear that this photo is of Megan Ballard and her cadre of other moms enjoying a day out in Temecula Wine Country, courtesy of a company called Aall In Limo & Party Bus. Even though the brand isn’t featured in the photo, it still gets a mention in the post as a company that has made this experience possible, giving them some exposure. It’s a great example of simplicity in influencer marketing. This kind of company could have actually made it into the photo in a logical way, as the women could have posed in the same way in front of their limo. BUT this strategy provides a "way in," so to speak, for certain experience companies that wouldn’t naturally generate interesting photos with just product placements. There are certain times of the year where almost everyone is looking for presents to buy their loved ones. Christmas and Valentine’s Day immediately spring to mind. If your brand sells anything that would make a great gift for one of these holidays, you can use this to your advantage when targeting fashion influencers around these seasons. Influencers all over Instagram were sharing the gifts they were buying for their friends and family over the holidays, and giving the brands they bought them from a nice big shout out. The example above shows @feralcreature backing the benefits of eBay gift cards as presents. 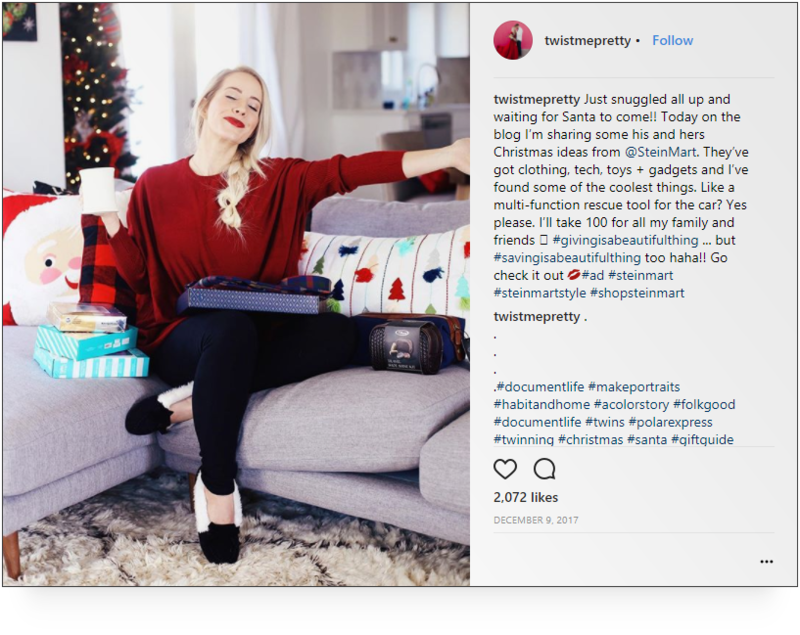 Other examples include lifestyle blogger, Abby Smith (@twistmepretty) promoting Stein Mart by showing off all the gifts she bought from the store (see her post here). Beauty blogger Jamie Rocker got creative with her sponsored gift giving by customizing her shoes with acrylic paint from Reeves. Playing the gift-giving or pay-it-forward angle can quickly widen your net because mostpeople will, at one point or another, find a reason to give someone else a gift. So, influencers can put your product in front of people who are closely connected to members of your target audience. So, while an influencer's followers may primarily be interested in fashion and beauty, their parents might really enjoy golfing or be looking forward to cruise season. So, there you have it! Seven killer strategies to help you take advantage of the sway fashion influencers have over their followers. If you look and plan strategically, an opportunity present itself. Influencer marketing is the perfect example of brands sharing each other’s successes. Make the most of the fact that some people have a million followers on social media and use their influence to turn some of those followers into your new customers. TheShelf.com is a platform that’s here to match you up with the best and most relevant influencers. So, take some of the challenge out of that first step of deciding who to collaborate with by letting us help you with your influencer marketing strategy. We also run influencer marketing campaigns from start to finish. Click here to find out more about The Shelf and how we can help you get started with successful influencer marketing.